I spent years in illness on every level. I tried painting with acrylics years ago, but felt very sick around it physically so it did not go far. I recently got inspired through MARK! and thought I should give it a go again. I am not certain I am AOK physically yet, but I did not get sick like I used to. 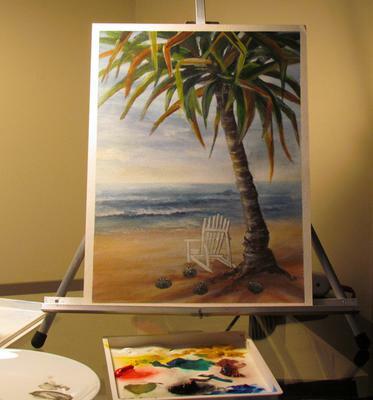 :) This painting is my first beach scene inspire by Mark's Pandanas Tree paintings. Love his work! Enjoy! Blessings to you all. Comments for My first Beach Scene Ever! Hey Kathryn, I think this is a lovely picture and is really refreshing and beautiful. Very sad to hear about your illness. I hope you get well soon. The article is about My first Beach Scene Ever.This is an amazing article about beach scene and this is very informative and you have done an great work on this website and its articles. I think It worked with the distance because of the light that I also placed in the water back near the sky? Try that and see what happens. Light pushes back and darker come's forward I have learned. Hi Kathryn ... I'm really envious! You've achieved such a sense of distance in both the ocean and sky, which is something I really struggle with. The horizon really looks a long way away! Hope your health continues to improve - I've just had a minor health issue with a shoulder operation. As a result I have been painting with my "wrong" had and I can tell you that I won't be posting the results up here. Look forward to seeing more posts. Thanks so much for submitting to the site, and for sharing your journey. Mark and I think you've done an awesome job on your first ever beach scene. I hope that painting with acrylics continues to bring you joy.